The big-case G-Shock GA-700 series gets the layered neon color treatment with the addition of three new models. 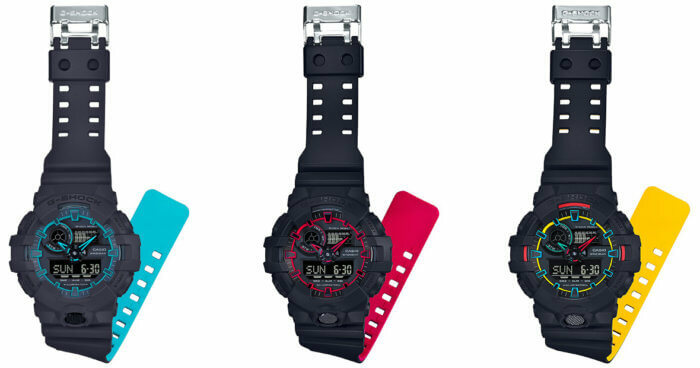 G-Shock Japan announced the blue-accented GA-700SE-1A2JF, the red-accented GA-700SE-1A4JF, and the yellow-accented GA-700SE-1A9JF for an August 2017 release with a list price of ¥15,500 JPY each. The bands and bezels are a matte black with stealth lettering. Neon accents inspired by street fashion accessories like sneakers and caps highlight the index, hands, and inner bands for a stylish modern look. Excluding the China-only GA-700BY-1A, this is the first time we’ve seen the layered-band treatment on the GA-700. The blue and red models bring to mind the movie Tron with their striking neon colors, while the yellow model offers a multi-color design with red, blue, and yellow accents on the display. Key features of the GA-700 include a large 53.4 mm-wide case, front-facing LED button, and estimated 5-year battery life.